Lee Falk (born Leon Harrison Gross, April 28, 1911 – March 13, 1999) was an American writer, best known as the creator of the popular comic strip heroes The Phantom and Mandrake the Magician, who at the height of their popularity secured him over a hundred million readers every day. He was also a playwright and theatrical director/producer, leading him to direct actors such as Marlon Brando, Charlton Heston, Paul Newman, Chico Marx, and Ethel Waters. Falk also contributed to a series of novels about the Phantom. Leon was born in St. Louis, where he spent his childhood and youth. His mother was Eleanor Allina (a name he would later on, in some form, use in both Mandrake and Phantom stories), and his father was Benjamin Gross. Both of his parents were Jewish. Benjamin Gross died when Leon was a child, and Eleanor remarried to Albert Falk Epstein, who became Leon's father figure in life. Leon changed his surname after leaving college. He took the middle name of his stepfather (Albert Falk Epstein), but "Lee" had been his nickname since childhood. His brother, Leslie, also took the name "Falk" around the same time. When he began his comics writing career, his official biography claimed that he was an experienced world traveller who had studied with Eastern mystics, etc. In fact, he had simply made it up in order to seem more like the right kind of person to be writing about globe-trotting heroes like Mandrake and the Phantom; the trip to New York to pitch Mandrake the Magician to King Features Syndicate was at the time the farthest he'd been from home. In later life, however, he became an experienced world traveller for real - at least partly, he said, to avoid the embarrassment of having his bluff inadvertently called by genuine travellers wanting to swap anecdotes. During World War 2, Lee also worked as chief of propaganda for the new radio station KMOX in St. Louis, Missouri, where he became the leader of the radio foreign language division of the Office of War Information. 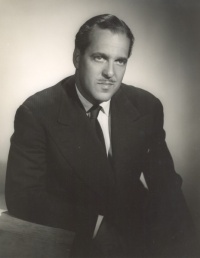 Lee Falk married three times, with Louise Kanaseriff, Constance Morehead Lilienthal, and Elizabeth Moxley (interestingly, he married Elizabeth, a respected stage-director, not long before he decided to marry the Phantom and his longtime girlfriend Diana Palmer in The Phantom strip). Elizabeth would sometimes help Lee with the scripts in his last years. She also finished his last Phantom stories after he died. Lee became the father of three children, Valerie (daughter of Louise Kanaseriff), and Diane and Conley (children of Constance Morehead Lilienthal). Lee died because of heart failure in 1999. He lived the last years of his life in New York, in an apartment with a panoramic view of the New York skyline and Central Park;and,lived during the summers in a house on Cape Cod. He literally wrote his comic strips from 1934 to the last days of his life, when in hospital he tore off his oxygen mask to dictate his stories. However, his two characters, Mandrake and, in particular, The Phantom, are still active and popular, both in comic books and comic strips. The Phantom was inspired by Falk’s fascination for myths and legends, like the ones about El Cid, King Arthur, Nordic and Greek folklore, and popular fictional characters like Tarzan and Mowgli from The Jungle Book. Falk originally tinkered with the idea of calling his character The Gray Ghost, but finally decided that he preferred The Phantom. Lee revealed in an interview that Robin Hood, who often wore tights in the stories about him, inspired the skin-tight costume of the Phantom, which is known to have influenced the entire superhero-industry. In the A&E Phantom biography, he also told that Greek busts inspired the idea of the Phantom’s pupils not showing when he wore his mask. The Greek busts had no pupils, which Falk felt gave them an inhuman, interesting look. It is known that the look of the Phantom inspired the look of what has today become known as superheroes. Lee thought that his comic strips would last a few weeks at best. Still, he ended up writing them for 65 years, until the last days of his life. Lee's biggest passion was the theatre. During a lifetime, he ran 5 theaters, and produced around 300 plays, and directed 100 of them. He wrote 12 plays, two of them musicals; "Happy Dollar" and "Mandrake the Magician", based on his comic strip creation. After Lee's death, his widow Elizabeth directed a musical called "Mandrake the Magician and the Enchantress", which was written by Lee, which was essentially the same as the previous "Mandrake the Magician" musical. Some of his plays starred well known actors like Marlon Brando, Charlton Heston,Celeste Holm, Constance Moorehead, Basil Rathbone, Chico Marx, Ethel Waters, Paul Newman, Ezio Pinza, James Mason, Jack Warner, Shelley Winters, Farley Granger, Eve Arden, Alexis Smith, Victor Jory, Cedric Hardwicke, Eva Marie Saint, Eva Gabor, Sarah Churchill, James Donn, Eddie Bracken, Ann Corio, Robert Wilcox, and Paul Robeson. The actors were all paid to perform, but many of them worked on fractions on what they would normally earn with their movie work. Lee was proud to tell that Marlon Brando turned down an offer of $10 000 a week to act on Broadway, in favor of working for Lee in Boston in 1953 in the play "Arms and the Man". His Boston contract was less than $500 a week. In May 1994, his birthplace St. Louis honored him with Lee Falk Day. On the premiere of The Phantom movie starring Billy Zane, Lee received a letter from President Bill Clinton, congratulating him with his achievements. On April 28 2015, a induction ceremonie has taken place - with his widow and daughter in attendance - to make Lee Falk one of the nominees for the St. Louis Walk of Fame; a brass star and a bronze plaque containing the inductee's name and a short summary of his accomplishments are set into the sidewalk at 6142 Delmar Boulevard. "I give 100% of my time to theatre, and what's left goes to comics..."
(When asked about his age): "Never older than age thirty-nine. "My only politics is up with democracy and down with dictatorships." "Each artist, out of his own interests and imagination, creates his own world in his strip - this is true of Peanuts, Beetle Bailey, Popeye, all good strips. And you accomplish this not by imitating others - you come up with your own idea. To me, The Phantom and Mandrake are very real - much more than the people walking around whom I don't see very much. You have to believe in your own characters." "The Phantom is a marvelous role model because he wins against evil. Evil does not triumph against the Phantom... He hates dictatorship and is in favor of democracy. He is also opposed to any violation of human rights." This article, in the version of October 11, 2007, includes information from Wikipedia: Lee Falk. This page was last edited on 28 March 2016, at 12:40.